A dispatch from Vladimir Putin's election day. MOSCOW – If you want to talk about trigger moments, you could do worse than the night of December 4. 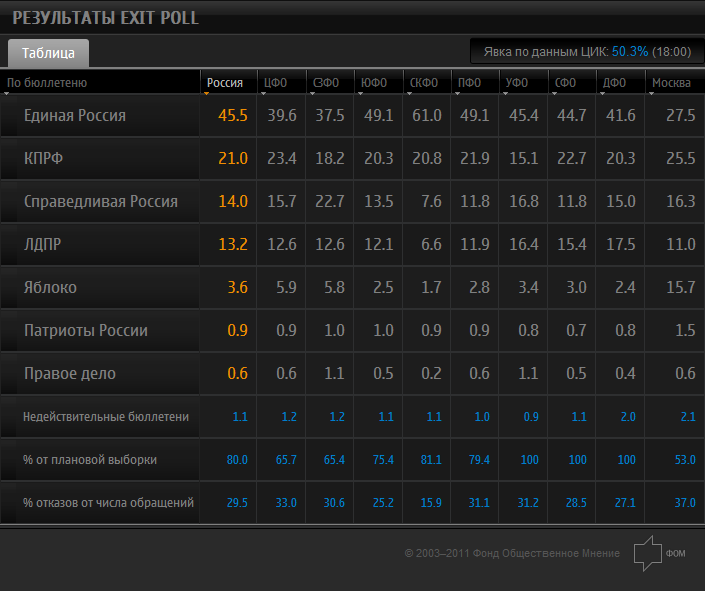 As the polls closed in Russia’s parliamentary elections that Sunday, the Kremlin’s polling firm FOM posted an exit poll on its website that gave United Russia, the ruling party created to support Vladimir Putin, 27.5 percent. It seemed a reasonable result: Moscow is a rich, highly educated city where United Russia, despite being backed by the full resources of the state, is virulently unpopular. By Monday morning, the exit poll had disappeared off the FOM website, replaced with an official result that bore no resemblance to the election day surveys: 46.6 percent. Moscow exploded in a rage that evening and many thousands of people came out to protest, something unheard of in the city for the dozen years of Putin’s rule. A line had clearly been crossed. After this, tens of thousands of Muscovites — Muscovites who had up until then been indifferent to politics — started coming out into the streets in the largest political protests Russia had seen since the collapse of the Soviet Union. Their demands — new parliamentary elections — were impossible, but the one thing you heard over and over at those first protests was a sense of offense: we are not idiots. "Politicians everywhere lie," one young man in a beautiful shearling coat told me at the December 10 protest on Bolotnaya Square. "But in other countries, they do it with more finesse. It’s not as crass as here." Exactly three months and three mass opposition protests later, that lesson seems to have been utterly lost on the Kremlin — or, worse, rudely ignored. Going into the March 4 presidential election set to restore Putin to the office he temporarily swapped out of four years ago, the going theory among the Moscow political chattering classes was that Moscow itself would have a relatively clean election, that the Kremlin would decide not to pour fuel on the fire by avoiding really flagrant election fraud of the sort we saw in December — the ballot stuffing, the so-called carousels of voters herded on buses to vote again and again and again. After all, 82,000 of the 370,000 new election monitors who volunteered to make sure these elections were more honest than the last were in Moscow. Elena Panfilova, the director of the Russian branch of Transparency International, reported a large mass of voters with absentee certificates — which allow you to vote outside your precinct — from faraway Tambov showing up at her precinct in suburban Moscow, where she worked as an observer. These absentee certificates were this election’s great innovation, giving the Kremlin armies of voters freed from their place of residence, and therefore making it impossible to make sure they only vote once. It seemed to be a massive plan: the Central Election Commission ran out of the certificates well before the elections started. There were 2.6 million of them. "Everyone expected a cleaner election in Moscow," says Alexey Navalny, who made his name as an anti-corruption fighter and is the opposition’s most natural, if reluctant, leader. We sat in the information center organized by his latest civil society project, RosVybory, one of the many new election monitoring initiatives that sprouted up in this winter’s unrest. "But these were naïve expectations, because this would have led to a second round." And why did Putin not want a second round? "A second round is not cool," Navalny argued when we talked. "If you win in the second round, then you’re just a politician who competes with Zyuganov. You’re not a cool guy…. In the political construct he’s created, you cannot show weakness. Which is why they haven’t carried out the demands of the protesters that would be easy to carry out – like firing the Central Election Commission chair, punishing even the small fry falsifiers. They clearly think that if you give the protesters a finger, they’ll take your arm. And a national leader doesn’t behave like this." In the meantime, Moscow filled with more special troops than I or most other people have ever seen. Special forces, interior ministry troops, military convoys at the entrances to Red Square, signal jammers, water cannons, soldiers walking around with ham radios strapped to their backs. Ostensibly, the massive presence was to secure the massive victory rally planned outside the Kremlin walls. It looked more like war, which given today’s tactics, the Kremlin is likely to see in tomorrow’s opposition protest on Pushkin Square: there’s just less and less patience for peaceful protest in an atmosphere turning increasingly toxic. "The last time I saw water cannons in Moscow was in 1990, when there were big protests in the city," recalls Yury Sparykin, the editor-in-chief of the media company Rambler-Afisha, and one of the organizers of the winter’s opposition protests. "That means it’s a good omen: only one year left." But what a year it could be. When Putin finally took the stage at 10 p.m. he brought Dmitry Medvedev, who had served as his placeholder president for the last four years, with him. As Medvedev spoke of a clean victory, which no one could take from them, Putin stifled emotion. Only a third of the ballots had been processed, but his projected results steadily climbed past the 60 percent mark. A tear ran down his cheek. "We won in an open and honest battle," he said, looking over a massive crowd that dwarfed any the opposition had ever summoned. Back at the RosVybory headquarters in a bohemian café up the street from the Kremlin, Navalny mounted a small wooden stage with chessmaster-turned-opposition figure Garry Kasparov. "We have no legitimate government," Navalny said. "We have no legitimate president. He who has declared himself president tonight is a usurper." And then he called on the quiet, deflated crowd to continue their struggle.